One of my favorite harvest-time foods is the sweet potato. And, it is now in season! Like potatoes, sweet potatoes are high in minerals, but they are also high in a number of healthy antioxidants including vitamins A, C, E, and B (folic acid) and the mineral zinc. In fact, it's the beta carotene (vitamin A) that gives sweet potatoes their orange color, so the darker the potato, the higher the vitamin content. One of my new favorite ways to enjoy sweet potatoes is with baked sweet potato fries, or more specifically Alexia Chipotle Spicy Sweet Potato Fries. These fries combine the savory flavor of the sweet potato with the spice of Chipotle for a flavor combination that is yummy and somewhat addictive. 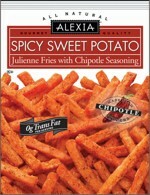 Alexia Sweet Potato Fries are free from saturated fats and nasty trans-fats, and they are cholesterol-free and kosher. And since we are talking about sweet potatoes here, they also provide you with 100% of the Vitamin A that you need each day. A three ounce serving of these sweet potato fries is just 130 calories, 4 grams of fat, and 3 grams of fiber, and 2 weight watchers points (when baked), making them the perfect snack or side dish. You can purchase Alexia's fries in the frozen aisle at Whole Foods, or other natural food stores. As you know, I don’t believe in frying anything. After all, it just adds fat and calories to the food, right? I am a big believer in baking your foods when you can, and this is one product that I do bake instead of fry. In case you missed my posting on baking fries, let me say again, it’s simple. Just bake your fries on high heat on a cookie sheet in the oven. I sometimes also finish them off by putting the oven setting on broil. I think fries baked in the oven are just yummier, anyway. They’re certainly crispier. And I don’t have to feel guilty about dunking them in a deep fry bath and adding those extra calories and fat to my waistline. You can also make your own, homemade sweet potato fries. All you do is wash and peel a few sweet potatoes, cut them into strips, and bake them. Calorie wise, all you are eating in this case is the sweet potato so the numbers are even more appealing diet wise. And, if you’re feeling even more indulgent, you might also consider melting some mini-marshmallows on top the fries during the last few minutes of baking. Yum! PS. If you are in the mood for something fry-like and don't have time to bake, check out these other crunchy low calorie snack time fries that I like.